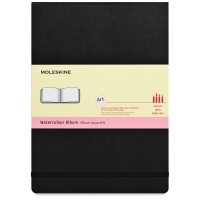 Moleskine Folio is a top-quality collection that is dedicated to creativity, free expression, and design. 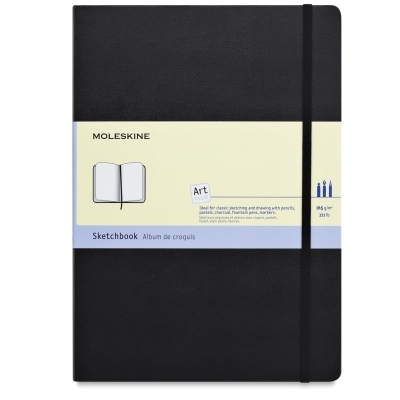 Folio books offer a generous space to be filled with drawings, projects, and writings. Produced to the highest standards using top-quality materials, all of the papers used for the Folio Collection are FSC (Forest Stewardship Council) certified. 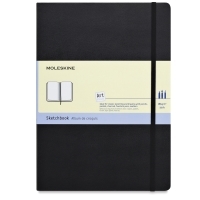 Sketchbook — Moleskine Folio Sketchbooks contain 96 pages of heavy, high-quality paper, sewn into a hard black cover and bound on the long side. An elastic band keeps the book securely closed. Choose A4 or A3 sizes. Watercolor Album — Moleskine Folio Watercolour Albums contain 60 pages of heavyweight, 200 gsm, cold press paper that contain 25% cotton fibers. The paper is identical on both sides. The pages are sewn into a hard black cover, bound on the short side. An elastic band keeps the book securely closed. Choose A4 or A3 sizes.